“I recently completed the Executive Certificate in Global Marketing and found it to be an extremely insightful course. The video lessons along with the various readings provided me with a comprehensive overview of the concepts covered throughout the program. The topics and tools that are covered are extremely relevant to me, and I utilize many of the tools in my day-to-day professional career. The courses challenged my real-life experiences in the marketing management field, and have helped me to broaden my scope of viewing opportunities as well potential challenges in a different light.” - Chris Keswani, LCD Dreams, Inc.
“Thunderbird Online’s Essentials of International Credit & Trade Finance and Advanced International Credit & Trade Finance courses were comprehensive and directly applicable to my current position as a Global Manager of Credit & Collections. My company and future career are sure to benefit. Many thanks!” - Carolyn Crowell, Drew Marine USA, Inc.
“The courses within the Executive Certificate in International Credit & Trade Finance were professionally presented with a wealth of materials surrounding financing options, financing documents, and detailed information surrounding credit & collection strategies for Europe, Asia, Middle East, South America, and North America. This is definitely a program worth pursuing if you work in the field of international credit or treasury.” - Steve Wickens, Strike Zone Management Consulting Services Inc.
“I recently completed the online Advanced International Credit & Trade Finance course, and I found the content to be informative, engaging, and challenging. The instructors really know their material, and were always available if I had questions. 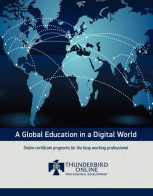 I am happy I took the online course, and I look forward to continuing my training with Thunderbird Online.” - Don Walker, Cree, Inc.